Šųkxete means literally "big dog," not from any resemblance to this animal, but from a functional equivalence, as team of dogs used to do the work to which horses were subsequently employed. Consequently, there is some propriety to the translation "big servant." Links: Sun, Moon, Hare, Trickster, Wolf & Dog Spirits, Bluehorn (Evening Star), Little Fox, Cougars, Mice. 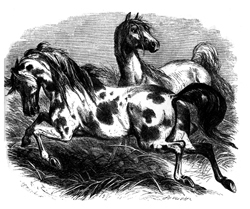 Stories: mentioning horses: The Big Eater, Thunderbird and White Horse, The Orphan who was Blessed with a Horse, Sun and the Big Eater, Rich Man, Boy, and Horse, Hare Recruits Game Animals for Humans, The Horse Spirit of Eagle Heights, Trickster Takes Little Fox for a Ride, James’ Horse, The Boy who was Blessed by a Mountain Lion, The Boy who Flew, Pete Dupeé and the Ghosts, They Owe a Bullet, The Man Whose Wife was Captured (v. 2); featuring Sun as a character: Sun and the Big Eater, The Big Eater, The Children of the Sun, Grandfather's Two Families, Hare Burns His Buttocks, The Birth of the Twins; pertaining to the Moon: The Markings on the Moon, Black and White Moons, Berdache Origin Myth, Sun and the Big Eater, The Big Eater, Hare Kills Wildcat, Grandfather's Two Families; mentioning coyotes: Coyote Goes on the Warpath, The Scenting Contest, Wojijé, The Raccoon Coat, Spear Shaft and Lacrosse, Redhorn's Sons, Redhorn Contests the Giants, Trickster and the Eagle; in which mice are characters: Little Brother Snares the Sun, Trickster Takes Little Fox for a Ride, Waruǧábᵉra, Hare Kills Wildcat, Ocean Duck; featuring Trickster as a character: The Trickster Cycle, Trickster Soils the Princess, Baldheaded Warclub Origin Myth, Trickster, the Wolf, the Turtle, and the Meadow Lark, Trickster and the Geese, Trickster and the Dancers, Lake Winnebago Origin Myth, The Markings on the Moon, The Woman who Became an Ant, The Spirit of Gambling, The Medicine Rite Foundation Myth, The Green Man, The Red Man, Waruǧábᵉra; featuring Hare as a character: The Hare Cycle, Medicine Rite Foundation Myth, Hare and the Grasshoppers, The Spirit of Gambling, The Green Man, The Red Man. 1 Paul Radin, XI. 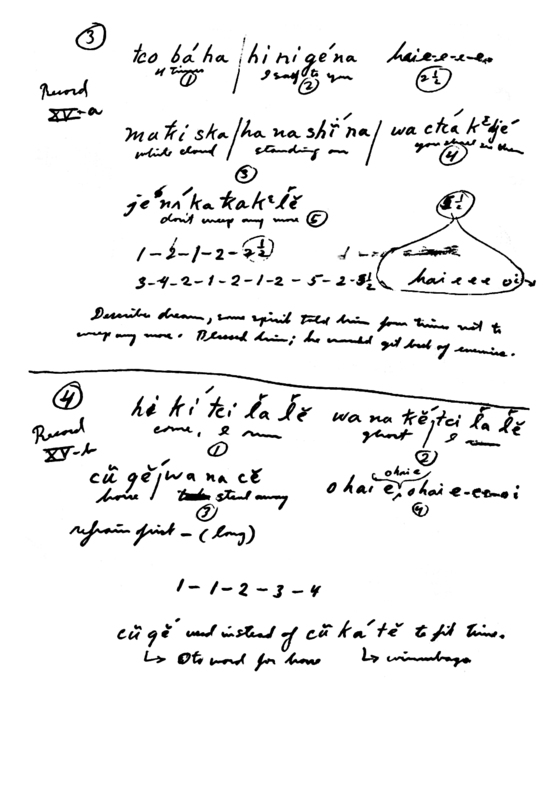 Untitled, Winnebago Notes, Winnebago III, #11b, Freeman #3892 (Philadelphia: American Philosophical Society, 1909, recopied and corrected, 1945) pp. 61-63. Told by Frank Ewing. 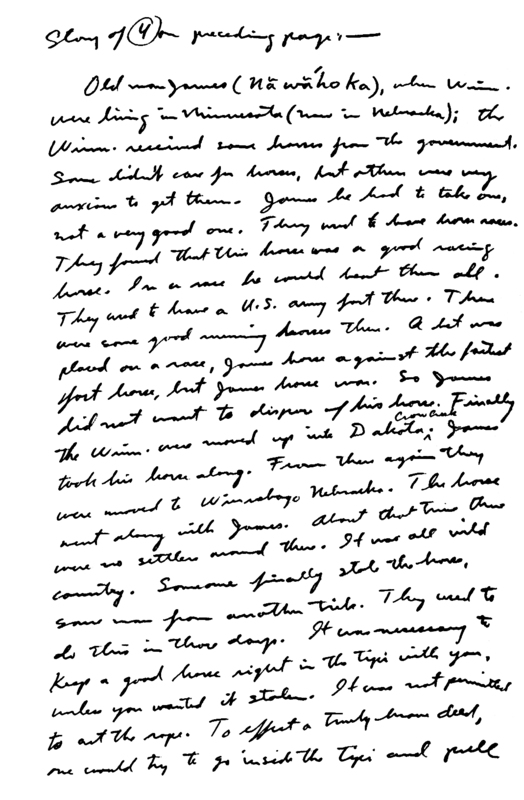 Paul Radin, "The Sun," Transcripts in English of Winnebago Tales, Winnebago IV, #7L, Freeman #3860 (Philadelphia: American Philosophical Society) 1-9 (= 78-86 = 978-996). 2 Paul Radin, Winnebago Hero Cycles: A Study in Aboriginal Literature (Baltimore: Waverly Press, 1948) 111-113. 3 Mary Carolyn Marino, A Dictionary of Winnebago: An Analysis and Reference Grammar of the Radin Lexical File (Ph.D. Thesis, University of California, Berkeley, December 14, 1968 [69-14,947]) 160, sv šųk. 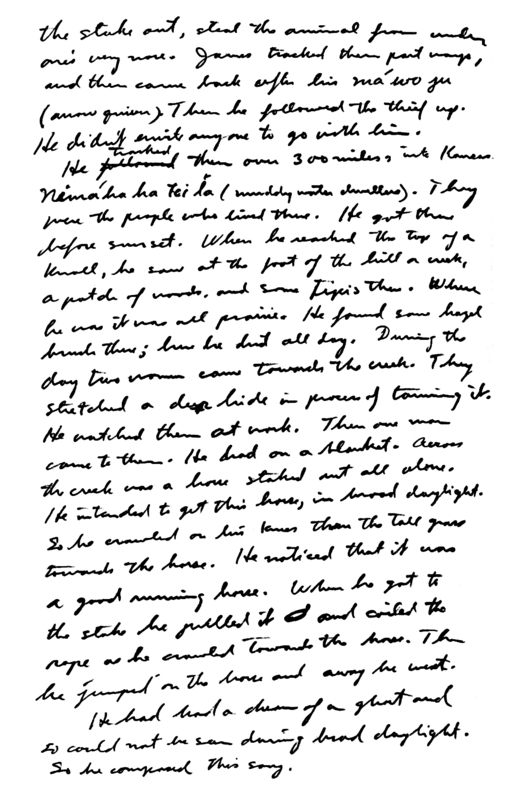 4 "Wakjukaga," in Paul Radin, Winnebago Notebooks, Freeman #3897 (Philadelphia: American Philosophical Society, 1912) Winnebago V, #7: 548-566. A translation has been published in Paul Radin, The Trickster: A Study in American Indian Mythology (New York: Schocken Books, 1956) 50-52. 5 Kathleen Danker and Felix White, Sr., The Hollow of Echoes (Lincoln: University of Nebraska Press, 1978) 38-42. Informant: Felix White, Sr.
7 John Michael StCyr, [untitled], in Paul Radin, Winnebago Notebooks, Notebook #19 (Philadelphia: American Philosophical Society, 1909?) 33-39. 8 Charles E. Brown, Lake Mendota Historical Excursion. Second Issue (Madison: Wisconsin State Historical Museum, 1926) 11; Charles E. Brown, Lake Mendota Indian Legends (Madison: University of Wisconsin, 1927) 6; Charles E. Brown, Lake Mendota Prehistory, History and Legends (Madison: The Wisconsin Archeological Society, 1933) 6; Dorothy Moulding Brown, Indian Legends of Historic and Scenic Wisconsin, Wisconsin Folklore Booklets (Madison: 1947) 60. 9 Henry Rowe Schoolcraft, Information Respecting the History, Condition and Prospects of the Indian Tribes of the United States, 4 vols. (Philadelphia: Lippincott, Grambo & Company, 1856) 4:238. 10 W. C. McKern, Winnebago Notebook (Milwaukee: Milwaukee Public Museum, 1927) 314-315. Cp. the song about this exploit, McKern, Winnebago Notebook, 313④, Recording XV-b.